Budget FY20: Balancing Pragmatism vs. Populism? The government missed the FY19 fiscal deficit target by 10bps to 3.4% of GDP, which was largely in line with market expectation. In its announced FY20 interim budget, the central government bias appeared to be clearly tilted towards populism (ahead of the general elections due in April/May 2019) post the weak performance in recent state elections and concerns about farmers' distress. 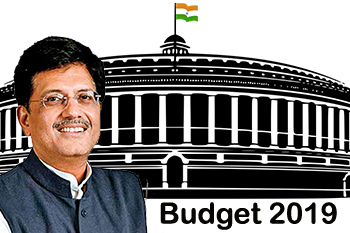 The budget was also used as a medium to reiterate various social sector schemes/development spending done by the government during its tenure. The government missed the FY19 fiscal deficit target by 10bps to 3.4% of GDP, which was largely in line with market expectation. However, the government estimates that FY20 fiscal deficit will remain elevated at 3.4% of GDP, which was a deviation from the 3.1% of GDP projected in the medium-term fiscal policy statement last year. The revenue collection assumptions (revenue receipts projected to rise by +14.3% YoY in FY20BE vs. 20.5%YoY in FY19RE) used by the government to arrive at its FY20 fiscal targets look to be relatively ambitious. The government continued to rely on tax buoyancy, higher GST collection, one-off revenue receipts including dividend transfer (Rs829bn) & divestments (stake sale in PSUs, Rs900bn) even as income tax rebates were provided to middle-class households. The growth in government spending (13.3%YoY in FY20BE) is estimated to remain buoyant (up 0.2% of GDP vs FY19). The quality of government spending seems to have deteriorated with capital expenditure projected at 1.6% of GDP (vs. 1.7% of GDP in FY19RE), while revenue expenditure is estimated to go up to 11.7% of GDP (from 11.4% in FY19RE). From a macro point of view, we view two announcements as key. First, the government announced assured income support to around 120 million small & marginal farmers (having cultivable land up to 2 hectares) under the programme “Pradhan Mantri KIsan Samman Nidhi (PM-KISAN)". Accordingly, the government will provide direct income support at the rate of Rs6000/ year (in three equal installments). The programme is effective from 1st Dec 2018 onwards and will cost the exchequer Rs750bn (0.36% of GDP). This was not a surprise considering the street was expecting some support to farmers but the relief was that the cost of this package was lower than market expectations. Second, the government increased the tax rebate provided to low middle-class households with income up to Rs500,000. This translates into a fiscal stimulus amounting to Rs240bn (0.1% of GDP). The government pursued expansionary fiscal policy, seemingly prioritising populism over prudence. While this should help support consumption growth in FY20, it could further delay the recovery in capex cycle, which is seen as key to sustainable growth. The gross market borrowing (Rs7.1trn) was much higher than market expectations and the bond markets have reacted to this news adversely. We expect the Reserve Bank of India to be cognizant of the risk to inflation from fiscal slippages going forward. We continue to expect the Monetary Policy Committee (MPC) to keep rates on hold in the upcoming policy review on 7th February. That said, we expect a change in policy stance from "calibrated tightening" to "neutral".